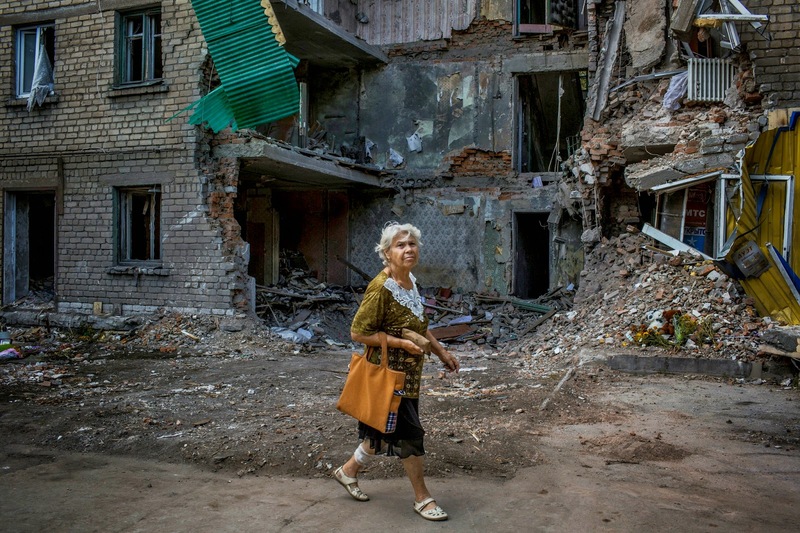 DONETSK, Ukraine -- One was a retired cook. Another installed alarms in cars. Another was a cleaner in a grocery store who had gone out to buy ground beef to make her son meatball soup. With international attention focused on the tragedy of Malaysia Airlines Flight 17, the deaths of these three civilians — some of the roughly 800 who have been killed in the battle over eastern Ukraine — have gone virtually unnoticed by the outside world. The Ukrainian military’s advances to reclaim territory from rebel control have come at a steep human cost. According to a United Nations count released on Monday, 799 civilians have been killed since mid-April, when Ukraine began to battle insurgents here, and at least 2,155 have been wounded. The killings have left the population in eastern Ukraine embittered toward Ukraine’s pro-Western government, and are helping to spur recruitment for the pro-Russian militias. In time, even if the Ukrainian military routs the rebels and retakes the east, the civilian deaths are likely to leave deep resentments here, and could complicate reconciliation efforts for decades. The rising toll of the conflict in eastern Ukraine — the first open hostilities in Europe in 15 years — is a direct consequence of the nature of the war here. Much of the fighting takes the form of low-tech airstrikes and artillery fired at a distance from aging weaponry, tactics that can inflict significant harm on civilians. In comparison, 330 Ukrainian soldiers have been killed, the United Nations said. There are no estimates for rebels. In a report released on Thursday, Human Rights Watch documented four instances of the use of unguided Grad rockets, which killed at least 16 civilians in and around Donetsk in nine days. While both rebels and Ukrainian forces use the rockets — descendants of World War II-era weapons — the investigation “strongly indicates that Ukrainian government forces were responsible” for the four attacks. “Using these kinds of weapons in populated areas is a violation of the laws of war,” said Ole Solvang, senior emergencies researcher at Human Rights Watch. Ukraine’s military strongly denies responsibility for any attacks that have caused civilian deaths. Vladislav Seleznyov, a military spokesman, did not comment on the report itself, but he said that soldiers were under orders not to harm civilians. “We are prohibited from using artillery in residential areas,” he said. But the military’s campaign against the rebels has increased the likelihood of civilian casualties given how deeply the rebels have embedded into the civilian population. As Ukrainian troops inched toward Donetsk and Luhansk in recent weeks, two regional capitals with a combined population of 1.5 million, residents feared the worst, looking to what happened in Slavyansk, a small city to the north that the military took by pounding rebel positions and flattening the neighborhoods where the rebels were. Those fears were soon realized. One of the main rebel bases in Luhansk is in a military recruitment office next to the main bus station, and it drew intense shelling, leaving power lines scattered like string over the shrapnel-torn pavement. And in Donetsk, where Ukrainian troops have pressed forward from the north and west for weeks, the Marinka, Petrovsky and Kuibyshevsky neighborhoods have come under heavy rocket fire. The barrages against all three areas, according to Human Rights Watch, originated from positions held by the Ukrainian military. Mr. Seleznyov said he could not comment on specific events. On July 21 in Kuibyshevsky, in a leafy area near a dental office and a library, Sergei Yakshin, 41, the man with the alarm business, was walking to his car. A rocket exploded nearby, killing him and another man instantly. A short walk away, a different rocket hit Valentina A. Surmai, a 72-year-old pensioner who worked at a local grocery store to support her blind husband. The cook, Alla A. Vasyutina, 60, bled to death in her kitchen after a piece of shrapnel penetrated the wall of her house. “She wanted to make us soup,” said Ms. Surmai’s son, Sergei, standing in his underwear, his eyes red. “I told her, ‘Mom, don’t go out,’ ” he said. He barely recognized her body in the morgue. Half her face and her left side were gone. Her death enraged Mr. Surmai. “If they give me a gun, I’m ready to go fight,” he said. A friend of Ms. Surmai’s, Alexandra Rud, 74, said she, like her friend, hated the rebels, but she blamed the government for Ms. Surmai’s death. “I want to shout to the whole world,” she said, her voice shrill, as artillery boomed in the distance. The violence has rearranged habits and daily routines. Konstantin, a morgue worker in Luhansk who refused to give his full name for fear of exposing himself and his family to attention, said he and his wife now sleep on a mattress stuffed into a small underground space in a garage used for repairing cars. Teatime chatter was about what survival supplies to put in their cellars, which now double as bomb shelters. Anatoly Leonidovich, the head doctor at the Luhansk morgue, said that after a particularly vicious battle two weeks ago, he received 15 bodies, all but one twisted and torn, consistent with artillery wounds. The next day, he was still getting calls. “Who are you looking for?” he said, speaking into a Soviet-era telephone. “Is he civilian or a rebel?” he asked. Rebels collect the bodies of their comrades and do their own paperwork, he said. Establishing responsibility for civilian deaths has been difficult. Supporters of the government in Kiev accuse the rebels, while those who favor Russia blame the Ukrainian forces. “Idiot!” shouted a stout woman with fiery red lipstick. She was glaring at Boris Besarab, a bespectacled security guard in a Luhansk neighborhood called Peaceful that was hit on July 14. He had been explaining why he believed that the angle of impact meant that rebels had fired the shell. “Take your glasses off,” she fumed, stalking away. The local disputes mirror those on a larger scale, with Russia and Ukraine blaming one another for attacks that kill civilians. Civilian deaths have been at the heart of Russia’s narrative against Kiev, though rarely mentioned is the fact that rebels cause them too. In one case, Ukraine claimed that Russia carried out an airstrike on an apartment block in the city of Snizhne, suggesting that a plane traveled from across the border, more than 12 miles to the south. But the angle of the 10 holes punched by the bombs and the direction of the damage indicated that the bomber was flying from west to east. Some residents suggested that the target might have been a rebel base just a quarter of a mile away. War is as much about perception as reality, and in some ways truth is powerless against what people want to believe. Most people interviewed at attack sites accused the Ukrainian forces, a pattern that bodes ill for Ukraine’s government as it tries to put the country back together again. “Look, there’s your Poroshenko!” yelled Viktoria Y. Iotova, referring to Ukraine’s president, Petro O. Poroshenko, and pointing to 14 Lenin Street in Snizhne, where at least 11 civilians were killed. “Who will answer for these human lives?” she added as she began to cry. Piles of personal items were strewn through the streets around her. A sewing machine lay between a teacup and an old Samsung laptop. One wall of a corner apartment remained intact, shielded from the blast wave. It told of life before the bombs: potted plants on a shelf, a red teakettle atop the cupboard and a neatly ordered spice rack with two rows of six jars apiece. There, amid the debris, a 4-year-old boy, Bogdan Yasterbov, was trapped. As a yellow crane lifted concrete blocks from the wreckage, local residents sat in shock, and the blue-eyed Bogdan screamed. It took hours before anyone heard him. Bogdan came into view, face down in a pocket of space under the rubble. He was carried out and laid on a stretcher, limbs limp. His bright blond hair was darkened by the dust. Bogdan survived, but his mother, Daria, did not.